This is the one that started it all. This butter is a blend of all natural unrefined organic Shea and coconut butter, cold-pressed olive, jojoba, castor, and sweet almond oils, steamed distilled essential oils, such as rosemary, lavender, tea tree, and bergamount. Since there is no heating during the blending process this whipped butter has beads of shea butter giving the butter a grainy feel that acts as a light exfoliant that melts into your skin and hair. All butters can also be used to style natural hair. Also available in a creamy (gently heated to maintain the beneficial properties of the butters). Available in both glass and plastic jars in 2, 4, 8 and 16 oz. ﻿ The whipped can be used everyday in hair daily maintenance and styling. The creamy is ideal for twisting or braiding as well as a conditioner for dry hair. Original/Lemon Meringue More Better Butter-16 oz. This whipped butter is based in 100% unrefined raw mango butter. Mango butter also known as Mango seed butter has all the benefits as Shea butter with a little bit more. Mango Butter's emollient properties may help keep your skin well hydrated, staving off the formation of fine lines and wrinkles. Like Shea Butter, Mango Butter may even offer mild protection from sun﻿ damage. With 100% unrefined organic coconut oil, Shea butter and cold-pressed olive, jojoba, castor, vitamin E and sweet almond oils, lemon, tea tree, and a few essential oils were added this blend. This butter is loaded with all the health benefits to both your skin and hair. Use this to battle stretch marks﻿, chronic dry skin and hair. Any Fragrance can be added to this butter; but is fine as is. All though this butter is whipped it is still very dense. Available in 2, 4 , and 8 oz. sizes. 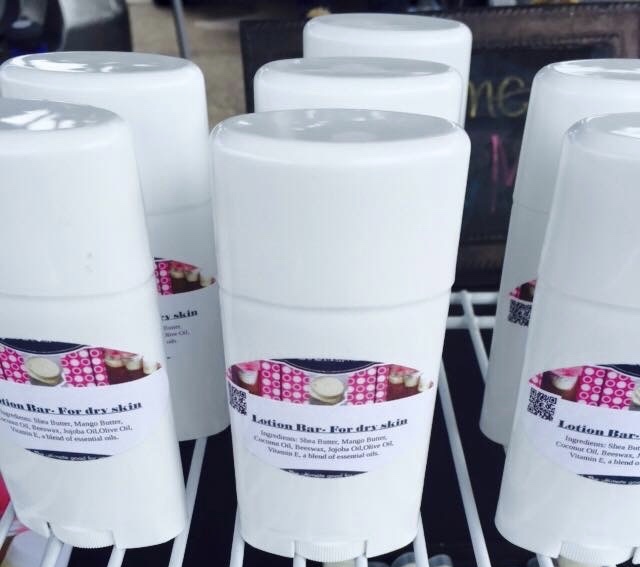 This all natural lip balm is blended with vitamin E, and coconut oils, beeswax. Poured into tubes or a cool compact sliding tins for a easy dip and apply. CUSTOMIZABLE great for party and wedding favors!!! This all natural ﻿lemon lime or mango flavored lip balm is blended with beeswax, coconut oil and vitamin E. Poured into tubes or a cool compact sliding tin for a easy dip and apply. Triple butter bar in a easy to use twist up tube.﻿ This lotion is blended with Shea, Mango, and Cocoa Butters along with coconut and essential oils to create the ultimate butter bar for your skin. This is a nice alternative to hand lotions. Fragances can also can be added to these bars. This blend of oils is also found in the body butters and bars. It great for aiding with patchy dry skin or for application to dry hair. It can even be used in baths (a few drops), and used as a hot oil treatment. Containing jojoba, olive, avocado, argan, grapeseed, castor, coconut, and a host of skin and hair loving essential oils. This has a slight lemony scent. All though all ingredients are natural, though unlikely some people may experience allergic reactions; please test out on hair and/or skin before daily use. Please request for a sample if you are uncertain or have know skin irritations. Keep products in a cool area as butter will liquefy and seperate if room temperature reaches over 70 F, if it does refrigerate until solid. Please use within a year of purchase to assure quality of product. If for some reason you are unable to use within a year product can be stored in the refrigerator in between use. ﻿Due to the nature of this product we cannot except returns. You are encouraged to request samples on items that you would like to try. Please allow 7-10 business days after your confirmation﻿ to receive your samples. To request a sample please contact me and let me know which product you are interested in trying. Samples are limited to 2 per household.